In this figure, the electric dipole moment is represented by a positive charge (red dot) and a negative charge (blue dot) that are spatially separated. 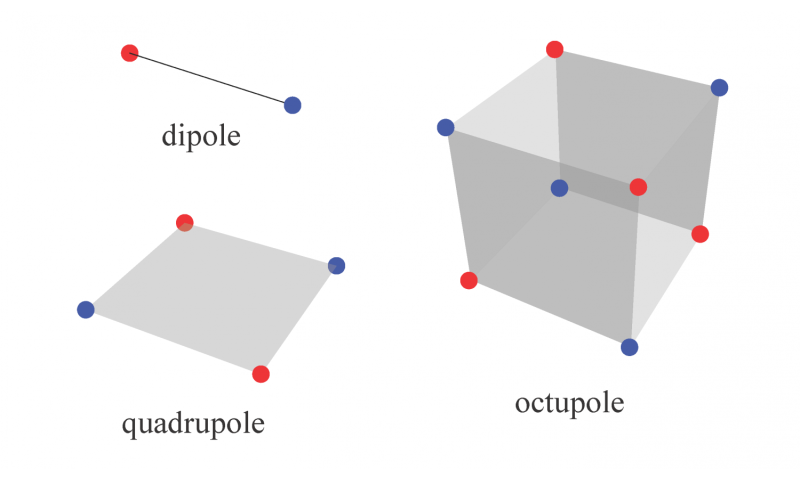 The quadrupole, made up of two opposing dipole moments, is inherently two dimensional, and the octupole, made up of two opposing quadrupoles, is inherently three dimensional. While materials with quantized dipole moments were previously known, insulating crystals with quantized quadrupole and octupole moments are topological phases unlike any discovered to date. Credit: Wladimir Balcazar, Department of Physics and Institute for Condensed Matter Theory, University of Illinois at Urbana-Champaign. Researchers at the University of Illinois at Urbana-Champaign and Princeton University have theoretically predicted a new class of insulating phases of matter in crystalline materials, pinpointed where they might be found in nature, and in the process generalized the fundamental quantum theory of Berry phases in solid state systems. What's more, these insulators generate electric quadrupole or octupole moments—which can be thought of roughly as very specific electric fields—that are quantized. Quantized observables are a gold standard in condensed matter research, because experimental results that measure these observables have to, in principle, exactly match theoretical predictions—leaving no wiggle room for doubt, even in highly complex systems. The research, which is the combined effort of graduate student Wladimir Benalcazar and Associate Professor of Physics Taylor Hughes of the Institute for Condensed Matter Theory at the U. of I., and Professor of Physics B. Andrei Bernevig of Princeton, is published in the July 7, 2017 issue of the journal Science. The team's work began with identifying a quadrupole insulator, but it soon became obvious that there were deeper implications. Benalcazar explains, "One of the new models the work presents has a quantized electric quadrupole moment. It's an insulator unlike all previously known topological insulators. It does not have gapless, low-energy surface states—the hallmark of such systems—which may be why these systems have avoided discovery for so long." "But remarkably," he continues, "even though the surfaces of the quadrupole insulator are gapped, they are not insignificant. In fact, they form a lower-dimensional topological insulator phase! Our calculations can predict when a system will harbor such boundary topological insulators—whether at the surfaces, hinges, or corners. Surprisingly, this property in its most basic form is related to the higher electric multipole moments." Revolutionary work in the 1990s and 2000s by Vanderbilt, King-Smith, Resta, Martin, Ortiz, Marzari, and Souza, made it possible to define the dipole moment of a crystal through a particular application of the Berry phase—a mathematical quantity that characterizes the evolution of electron wave functions in the momentum space of the lattice. That work represented a huge advancement in our understanding of topological electromagnetic phenomena in crystalline materials. It provided a link between a physical quantity (dipole moment) and a topological one (Berry phase). According to Hughes and Bernevig, the current research started as an effort to generalize the dipole moment theory to higher multipole moments. Hughes recounts, "At the earliest stages, Andrei and I were discussing the idea of extending the work on crystalline dipole moments to quadrupole moments. But it turns out, while the question seemed somewhat obvious once asked, the mathematical solution wasn't. Calculating multipole moments in a quantum mechanical system of electrons is challenging because the electron, a quantum mechanical particle, is a wave, not just a particle, and its location in space is uncertain. Whereas the dipole moment can be accessed by measuring just the electron displacement, a vector quantity, the quadrupole moments are trickier." To address this, the scientists had to invent a new theoretical framework. In addition, they needed to build models with the right properties by which they could benchmark their new analytical technique. But in fact, things happened in just the opposite order: Hughes and Bernevig credit Benalcazar with finding the correct model, a generalization of a dipole insulator with a quantized dipole moment. From there, it took an entire year to build the full theoretical framework. Heisenberg uncertainty principle, which usually states that you cannot measure both position and momentum of an electron at the same time. However, in the new quadrupole insulators, a different uncertainty principle is at work, preventing simultaneous measurement of the electron's position in both the X- and Y-directions. Because of this, the authors couldn't spatially resolve the electron locations using existing theoretical tools. "We could pin it down in one direction, but not the other, "Benalcazar recalls. "To get both directions simultaneously, we created a new analytical paradigm, essentially by separating the quadrupole moment into a pair of dipoles." Hughes adds, "At first, we ran every test we knew how to run on the models we proposed and kept coming up with nothing. The problem is, when two dipoles are on top of each other, they cancel each other out. To see the quadrupole you need some spatial resolution to determine if the dipoles are actually separate. In the end it turned out, we needed to look at the Berry phases one layer deeper, mathematically speaking." Finding a way to spatially resolve that second dimension represents a significant theoretical breakthrough. The authors devised a new paradigm for calculating the location of electrons that is an extension of the Berry-phase formulation. First, they use a conventional technique to theoretically split up the electron wave into two charge clouds, separated in space. Then they show that each cloud has a dipole moment. This two-step, nested procedure can reveal two spatially separated, opposing dipoles—a quadrupole. Bernevig remarks, "The topological insulators we have become used to in the past decade are all essentially described by a mathematical procedure called taking the Berry phase of some electronic states. The Berry phase of the interior of a sample, in effect, knows about the edge of a system—it can tell you what's interesting about the edge. To go one step beyond and solve what is potentially remarkable about the corner of a system or sample, you have to take, in effect, a Berry phase of a Berry phase. This leads to the formulation of a new topological quantity that describes the quantized quadrupole moment." In the last decade, the classification of topological phases of matter has been substantially developed. Significantly, this new work shows the yet unexplored richness of the field. It predicts an entirely new class of phases and provides the model and theoretical means to test its existence. Perhaps one of the most exciting aspects about the field of topological insulators is their experimental relevance. In the journal article, the team suggests three possible experimental setups to validate their prediction. Hughes acknowledges that a quantum simulation—an experimental technique that, for example, uses finely tuned lasers and ultracold atoms to replicate and probe the properties of real materials—would be the most immediately accessible. "It's exciting that, using current experimental technology, our model can be looked at right away," Hughes affirms. "We are hoping we or someone else will eventually find an electronic, solid-state material with these kinds of qualities. But that's challenging, we don't yet have a chemical formula." The authors indicate that the conditions to get this effect are fairly general, and as such there are many potential candidates in many classes of materials. "Or the realization could one day come from left-field, from some other utterly ingenious implementation idea that someone might devise," Bernevig quips. Benzalcazar is convinced that "this new understanding may open a whole collection of materials that have this hierarchical classification." This is fundamental research, and any potential applications are still a distant matter of conjecture. Because quantized observables allow for exquisitely precise measurements, it is conceivable that the novel electrical properties of this new phase of matter will be useful in metrology, electronic technologies, or in designing materials with prescribed bulk/surface/edge/corner properties. The authors agree, this work opens up many possibilities for new topological systems that were hidden before—hidden within the nested structure of the Berry phase mathematics. These hidden topological phases have a sharp connection to real physical observables—and there may be other physical phenomena in these materials that would be interesting to explore.